Sector 9 and Salty Timbers have come together to setup some wild rides. Check out the new Artist Series including the Tackle Fractal, Howl Ninetyfive, and Stag Swift. Sector 9 Skateboard Co. is proud to announce our Artist Series collaboration with Salty Timbers, a scrappy graphic manufacturer with an uncommon perspective. Founded in 2010 by multidisciplinary artist Nate Reifke, Salty Timbers builds upon the 17 years of illustration and design experience he stockpiled in the action sports and outdoor markets. While working from a quiet part of the Northwest Sierras, he crafted these classic and timeless designs for Sector 9. This series finds inspiration from our wild surroundings, drizzled with a thick glaze of golden California sun over each board. We firmly believe these boards have something in them for everyone, from the mountains to the sea, and everywhere in between. 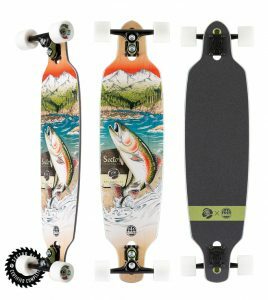 While Salty Timbers has created an angler’s dream on underside of the Tackle Fractal, we’re confident in saying this board will provide you with the type of turns that skaters dream of! The Sidewinder trucks feature a patented double kingpin style and are best suited for carving. The knurled kingpins stay securely in place while riding and will allow you to carve harder, deeper and smoother than you’ve ever imagined! Consistently on our best-seller list, this shape is dropped down for easy pushing, carving and pumping, and will surely provide the type of ride you’ve been craving. The Stag Swift draws from the well-known outlines we’ve been bringing to the marketplace for years and this seasons artwork makes it even more desirable! Salty Timbers has captured one of nature’s most prolific scenes on the bottom of our most recent adaptation of the Swift: a beautiful Stag in its natural, majestic environment. 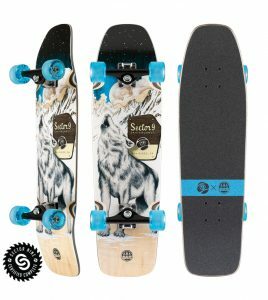 While we can’t promise that you’ll be looking this good while skating, we can commit that if you’re looking for a fun, easy-to-ride skateboard that will meet all your carving and commuting needs, this board is a smart choice and comes with a successful track record of putting smiles on the faces of those who ride it. If you haven’t found what you’re looking for, be sure to check out our full selection in our web store. 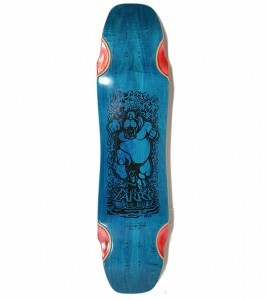 We’ve got one of Canada’s largest selection of longboard and skateboard decks and completes ready to ship worldwide.